I recently discovered Conni from Art in the Find. Her instagram feed is beautiful and filled with lots of fashion inspiration. As I was scrolling, I came across this cute denim jumper from Topshop. 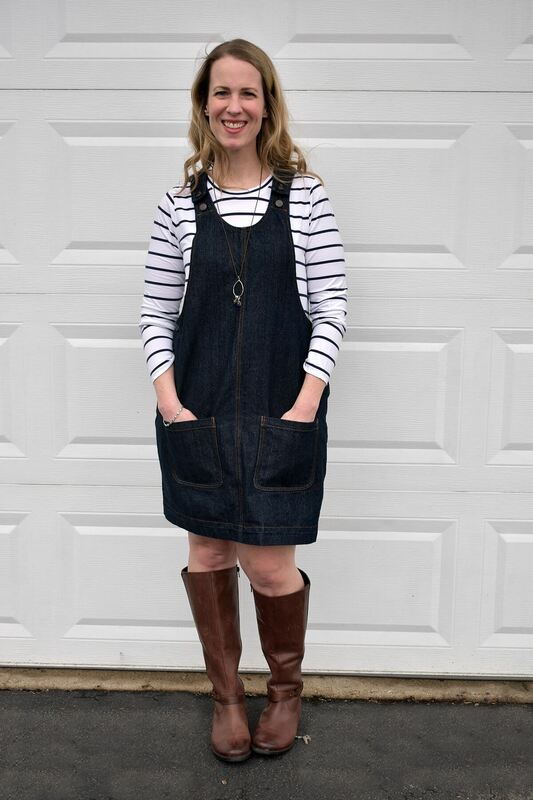 Immediately I started thinking about how I could use the York Pinafore pattern to make my own version. I’d been wanting to make a denim York for a while. I love my first one but the fabric doesn’t match a whole lot in my closet. I knew that one made in denim would be a lot more versatile. 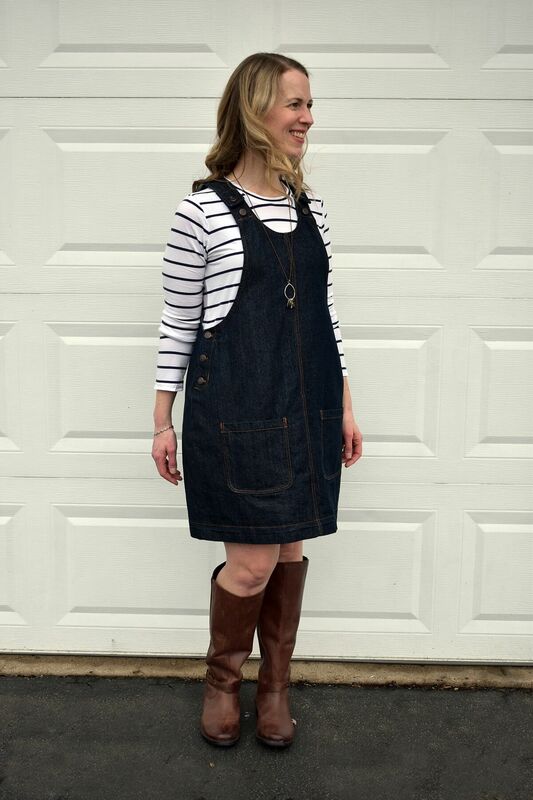 The fabric I used is a 10 oz non-stretch denim from Stonemountain and Daughter Fabrics. 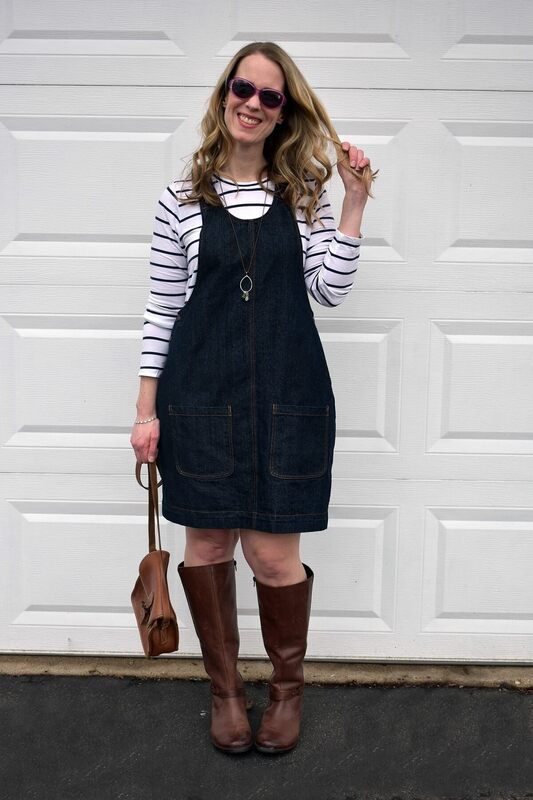 The denim is the perfect weight for this pinafore. It’s not too heavy, but has enough body to show off the cute cocoon shape of the dress. It’s 68″ wide so I took a chance and only ordered 1 yard. I had just enough fabric to squeeze out my York. (I did have to cut the patch pockets twice since the first set I cut was a little bit too small.) I used some long-stashed quilting cotton for my bias tape. Stonemountain Fabrics is one of our #sewbibs sponsors. 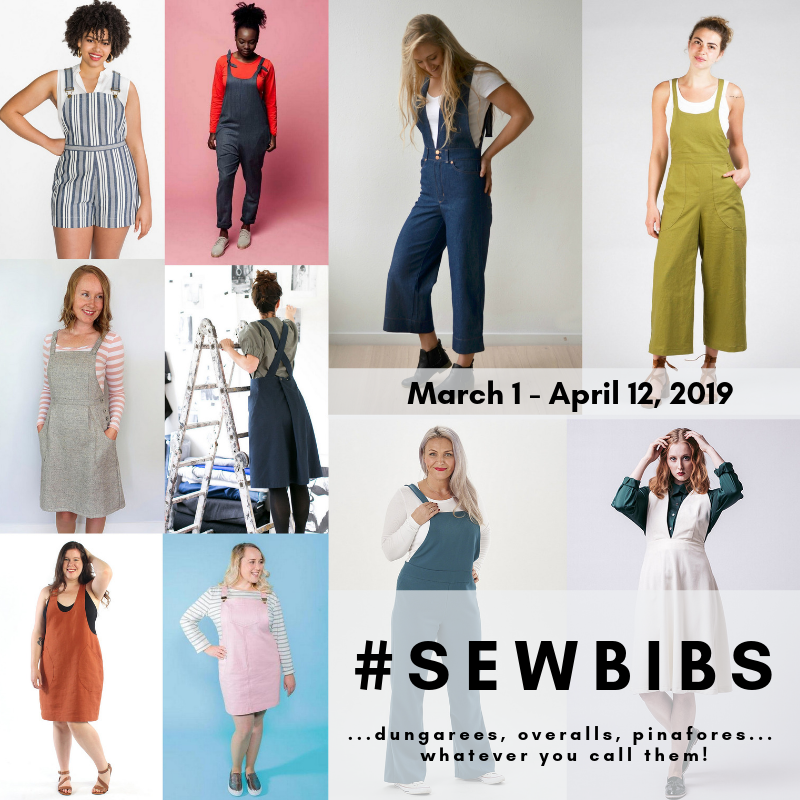 They are offering a 15% discount with code SEWBIBS15. The code expires on March 31. There are so many gorgeous fabrics on their site that would be perfect for your bibs. 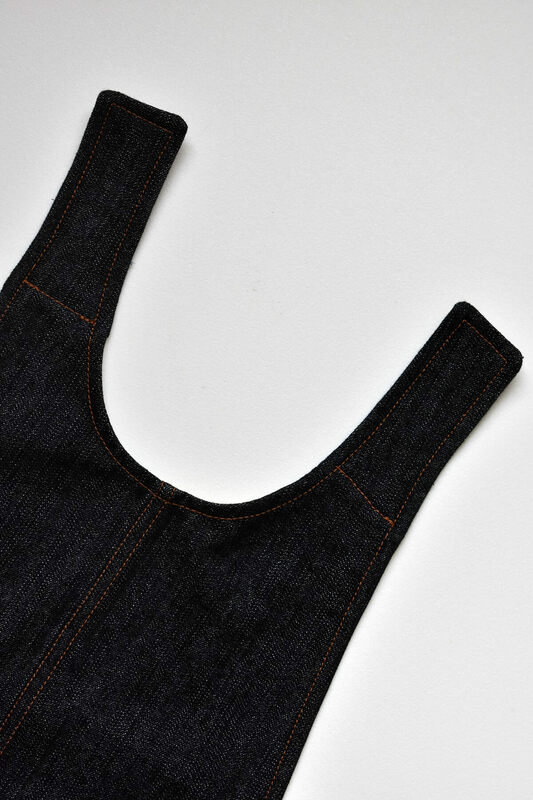 When I ordered this denim, I got some black Brussels Washer linen for a pair of Burnside Bibs, too. I’m hoping to start working on those this week. (Did you see that Heidi got some fabulous pink corduroy from Stonemountain to make her York Pinafore? I love how it turned out and it’s making me feel like I need a pink corduroy pinafore, too. It certainly wouldn’t be the first thing Heidi has made that I’ve copied. The first thing I noticed about the Topshop jumper was the cool hip button detail. I knew it would be a fairly easy change to the York to incorporate the buttons on the side. 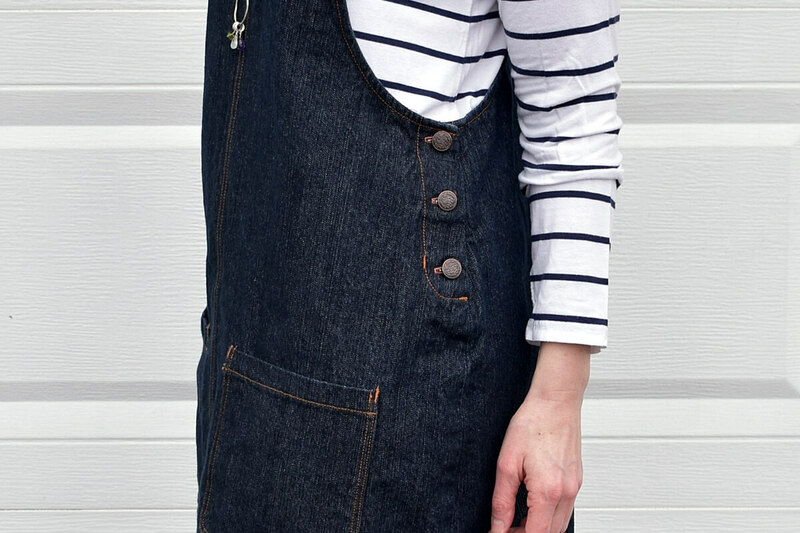 I referenced this tutorial from Closet Case Patterns for adding hip buttons to the Jenny Overalls. The Closet Case tutorial uses the fly shield from the Jenny overalls, but I subbed in the fly shield from the Lander pants since I’d recently used that pattern and hadn’t put it away. It would be really easy to draft a rectangle to use as a fly shield if you don’t have one hanging around. The Topshop dress also has a seam in the center front and back, which the York does not have. This was a very easy modification– I cut the front and back in two pieces, instead of on the fold. I added a 5/8″ seam allowance for both seams so that I could flat fell and topstitch them. I decided to cut the neckline of the dress between the two views included in the pattern. I also widened the front bib by 1/4″ starting at the outside shoulder and tapering to nothing where the curve starts at the waist area. I love the cool button strap detail on the Topshop dress. I lengthened the back straps on the York by 2.5″ and shortened the front straps by 1″ so that there would be some overlap for the button/buttonhole. One thing I didn’t do was to pay attention to the width of the front strap when I lengthened the back strap. I should have widened it a bit as I was lengthening. My back strap ended up narrower than the front strap and it looked a little strange when I overlapped them. My only choice was to trim down the front strap a bit to be the same width as the back. It wasn’t a big deal but I’d widen the back straps if I were to do it again. Using the straps as I guide, I cut facing pieces to use to finish the front and back shoulder areas. I knew that this area needed to be reinforced since I was going to be adding buttonholes and jeans buttons. I interfaced the facing pieces, folded the bottom raw edges up by 3/8″, and pressed them into place. Next, I pinned them right sides together with the shoulder straps. Then, I pinned my bias tape to the necklines and armholes. 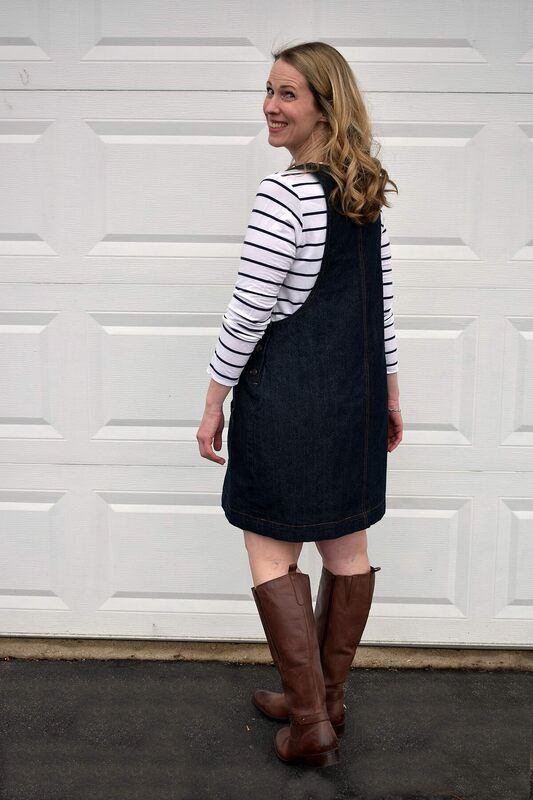 On the original York pinafore pattern the neckline is finished with one continuous strip of bias tape and both armholes are finished with continuous strips of bias tape. For my modified York I finished the front and back armholes separately, since there is now a working button fly (I guess that’s still what it’s called?) on both hips. I also finished the front and back necklines separately. 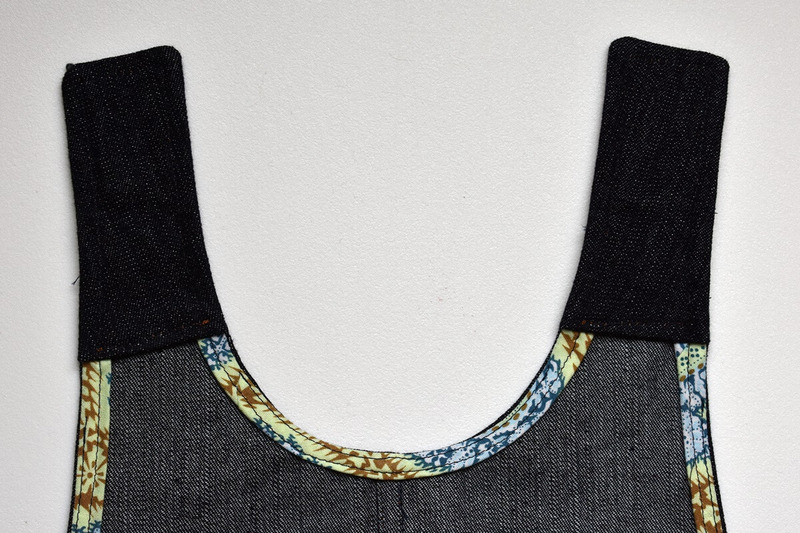 The bias tape only needs to slightly overlap the shoulder facings when you attach it since they will be turned right side out and the ends will be enclosed. I started attaching the bias tape at the front hip, sewed up to the shoulder, pivoted to sew the shoulder seam, pivoted down to sew the front neck curve, pivoted to sew across the other shoulder seam, then pivoted to sew down to the other front armhole/hip. 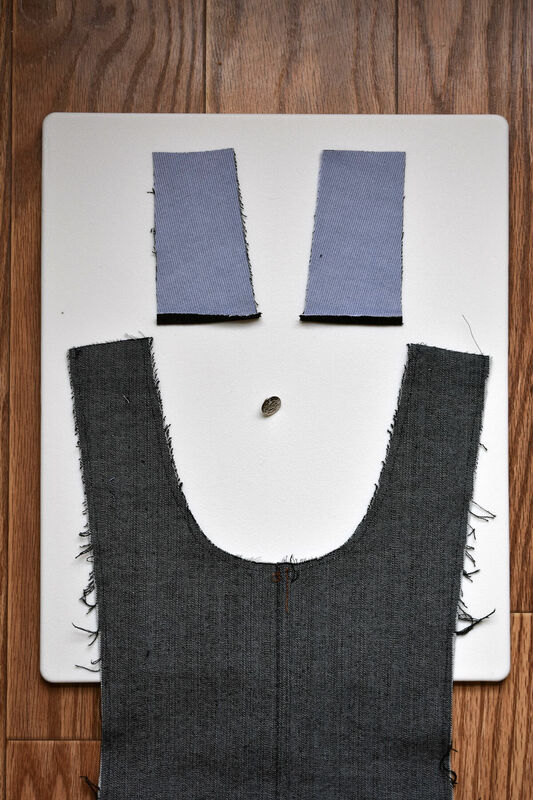 I followed the same steps to attach the bias tape and shoulder facings to the back bodice. After the bias tape was sewn into place I understitched the bias tape to the seam allowance. It’s best to do this before trying to turn the shoulder facing right side out. When you’ve got your straps turned right side out you can fold the bias tape and pin it into place for topstitching. I used copper topstitching thread on my dress but I kept all purpose thread in my bobbin. After I turned out the shoulders and pressed them into place I topstitched across the width of the strap along the bottom fold to enclose the raw edges of the bias tape and the raw edges of the facing. Once I had the straps all assembled I realized that I should have shortened the front straps by about an inch more. There is a lot of overlap between the front and back straps and they weren’t staying lined up nicely on my shoulders. I ended up adding another row of top stitching and sewed the two straps together. The issue with that solution is that now I can’t actually use the buttons on the shoulders. It is actually easier for me to get into the dress if I unbutton the shoulder straps and step into the dress instead of pulling it on over my head. I may unpick that top stitching and add a sew in snap that won’t be visible. That will keep the straps in place and I’ll still be able to use those buttons and buttonholes. 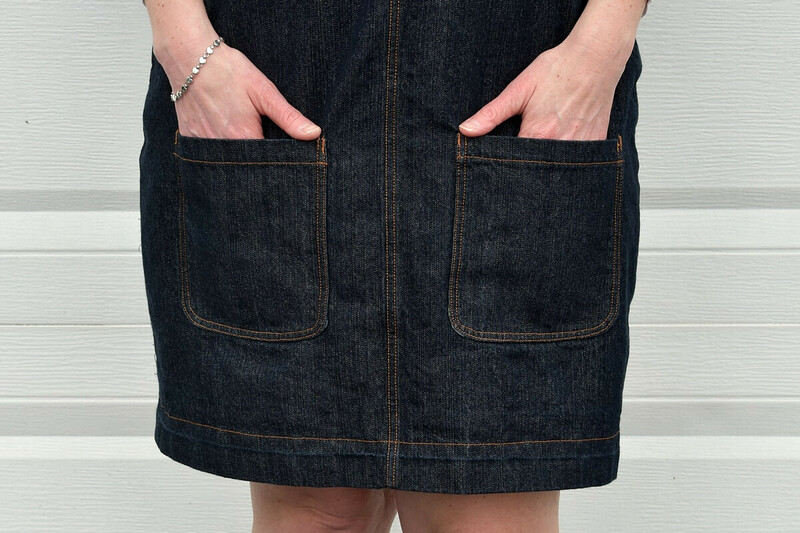 The last modification was to add the round bottom patch pockets to the front of the dress. I used the chest pocket from the York apron extension pack as a guide but widened it by an inch and made it about an inch and a half longer. The patch pockets are a fun touch and they were another opportunity to add some fun top stitching and bar tacks. 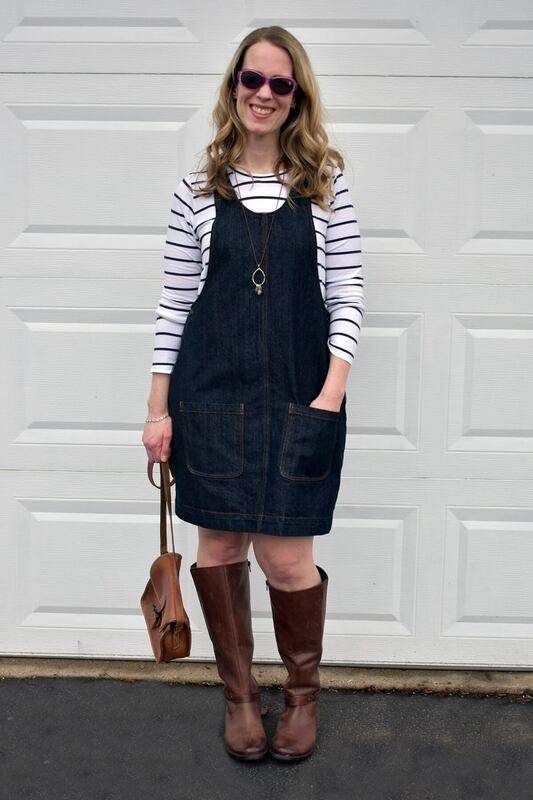 I am so excited about how my modified York pinafore turned out! I hope that over time it will fade into a color closer to my inspiration dress but for now I’m loving the dark denim with the copper topstitching thread and antique copper buttons. By the way, my sunglasses have been missing for a while so I’m wearing my daughter’s purple Sophia the First sunnies. It’s definitely time I get some new ones, haha. What do you think of this hack? I hope it inspires you! I had a lot of fun sewing this dress and I know I’m going to love wearing it! Just made a denim York. Really like the adaptation you did, might have to try another. They are sooooo comfortable! It’s super-cute! I have to say I haven’t been a huge fan of this pattern, but I really like it with all of your modifications. Thanks, Masha! Adding all of the details was so much fun— this pattern is a great base for hacks. I think I’m going to be wearing this a lot! Well this is completely adorable! Thank you as always for all the great tips. You are going to get so much wear out of this version. 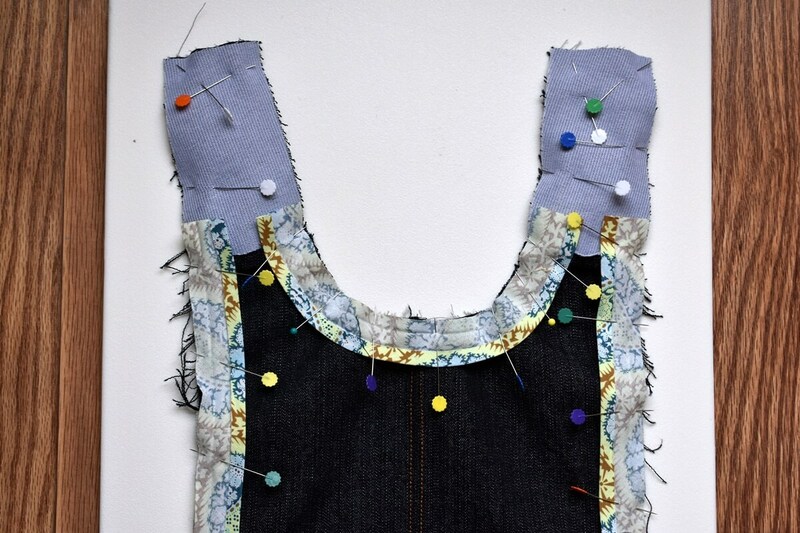 You definitely took it to a new level with the buttons and top stitching! Fabulous and chic! Thank you, Julie! I absolutely love topstitching so it was really fun to add all of those extra details. I know this is going to be a new favorite. I can’t wait until it starts to fade a bit! I love this! 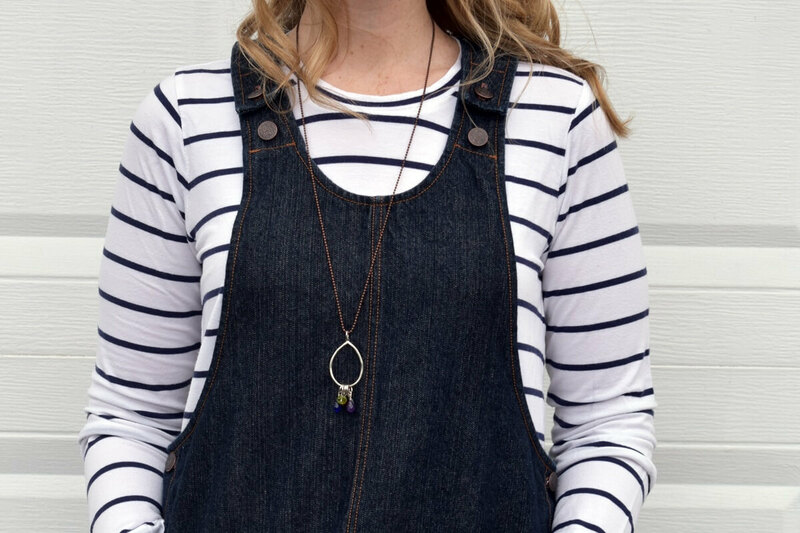 Your jeans inspired top-stitching is on point! Can you say a few words about how you did that or if you used a tutorial for it? Thank you, Teresa! I like to use my edge stitching foot for the row of top stitching that is closest to the seam line. It has a guide and I line up the needle to be about 1/8” inside of the guide. I sew that outer line first. It takes some trial and error to figure out if you need to adjust any tension setting on your machine if you’re using actual topstitching thread, like I did. (I always use regular, all purpose thread in the bobbin.) Then for my second pass, the inner line of topstitching I use my 1/4” piecing foot and set my needle so that it is about 1/4” in from the first line of topstitching. (My edge stitch foot has a guide that is in the center of the foot and my 1/4” piecing foot has a guide that is on the right side of the foot. 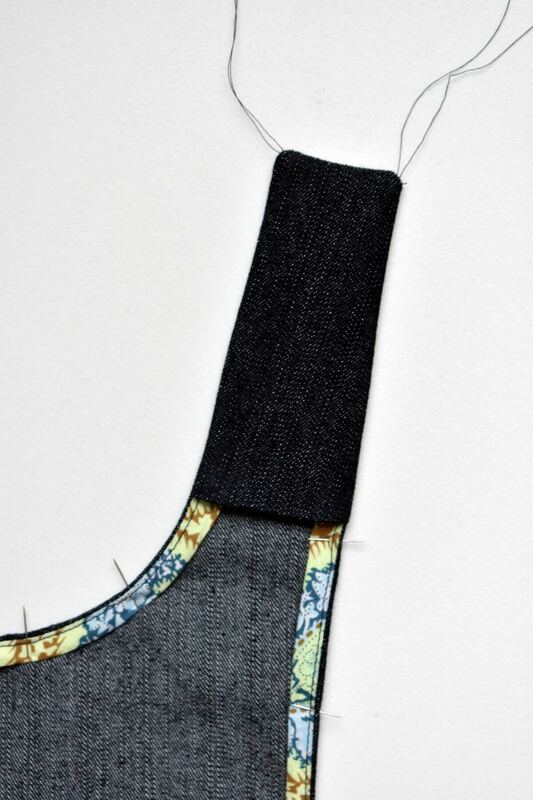 I like to use both feet for my topstitching but depending on the feet your machine has you might prefer to use the same foot and adjust your needle position. I do that on my backup machine.) I’ve made quite a few pairs of jeans and other denim stuff where I’ve done this type of topstitching so I’ve had lots of practice. When I first started I used this tutorial from Closet Case and it was really helpful! I have just bought the York pattern and some denim. You have inspired me to make some changes to mine as I make it. Front and back seam for sure. Yay, Jo! 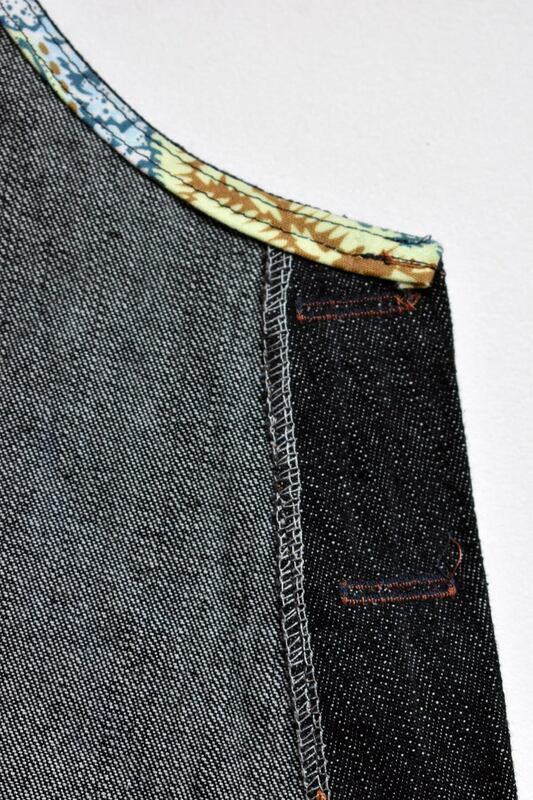 I think the front and back seam are a really nice touch, especially in denim. I love the added detail of the topstitching in the front and back.